Every business firm requires assistance in the logistics for their day-to-day growth and development. Almost every enterprise whether it is a small or a big MNC, if you are producing something, it has to be delivered on time. So, that’s why the transportation plays a major role for almost every firm in India. 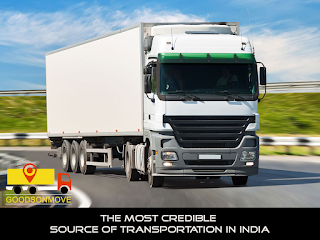 65% of India’s transportation depends upon the logistic industry. Trucks are used mostly to serve their purpose. GOODSONMOVE provides 24x7 services across India. As we know there are many logistics firms who want to deal with the truck vendors but face too many difficulties like bargaining with them leads to the wastage of their time, fear of goods not reaching on time. But as we know that there’s a solution to every problem and ‘GOODS ON MOVE’, a logistic firm which offers you with trucking and transportation solutions will help you with such problems. You just need to sign-up at www.goodsonmove.com and your firm can easily avail our services and book trucks online for loading and unloading of freight and that too at a reasonable cost, through the bidding process. It will conserve your time and money and will assure the safety of your freight. No Comment to " The Most Credible Source of Transportation in India "